New book! 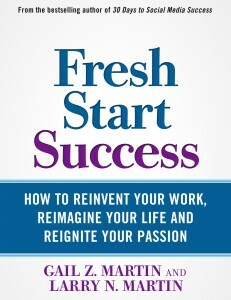 Fresh Start Success: Reinvent Your Work, Reimagine Your Life and Reignite Your Passion—41 True Stories Show You How! Now available on ebook and in print! Within these pages, you’ll meet forty-one people who made successful big changes in their lives and work. They come from all different industries and career paths, following a wide variety of interests, and redefining “success” for themselves along the way. They hail from all over the world, represent a range of ages, and came to the decision to make a change in their own unique ways, but every single one found success from following his or her passion. Our Fresh Start Success profiles include Katana Abbott, Amber Allen, Christine Bové, Debbi Dachinger, Melissa Darnay, Teresa de Grosbois, Jo Dibblee, Barbara Edie, Sheri Fink, Dawn Fleming, Marla Goldberg, Tamara Green, Oksana Gritsenko, Christine Hassler, Steve Hobbs, Wendy Ida, Mike Jaffe, Lisa Jendza, Grace Kelly, Karen Kessler, Poonam Gupta-Krishnan, Lisa Manyon, Sharon McRill, Lisa Mininni, Faith Monson, Sheevaun Moran, Loriann Oberlin, Debbie Peterson, Lauren Brett Randolph, Danielle Ratliff, Sherri Richards, Cha~zay Sandhriel, PhD, LeeAnn Shattuck, Pierette Simpson, Susan Sklar, Gail Watson, Patryk Wezowski, Lisa Woodie, and Wendy Woodworth. My husband and co-author Larry N. Martin and I round that number out to forty-one since we made our own big personal and professional reinventions, and the experience sparked our interest in finding how other people coped with change and reimagined their lives and work. Starting over doesn’t have to mean starting from scratch. The easiest way to pick yourself up and dust yourself off is to look at where you’ve been and find the elements that worked best for you—then look for more of those same things going forward. The 41 people Larry and I interviewed for our new book Fresh Start Success: Reinvent Your Work, Reimagine Your Life and Reignite Your Passion—41 True Stories Show You How! all had several key mindsets and behaviors that helped them create successful new beginnings. Figuring out how to ‘recycle’ your skills, experience, education and expertise and build a fresh start is one of the crucial behaviors for making a successful shift. Grab the book and discover how to make a successful big change in your own life! Buy it now! https://a.co/63C38cs. Comments Off on New book! Fresh Start Success: Reinvent Your Work, Reimagine Your Life and Reignite Your Passion—41 True Stories Show You How! Now available on ebook and in print! Sometimes, as the saying goes, life is what happens while you’re making other plans. When a twist of circumstance leaves you flat, start with what you know. One of the most empowering tools for making a Fresh Start Success is a list. Sit down with several clean pieces of paper, and make a list of all the things you’re good at. What do you know how to do? Write it down. Next, make a list of the things you enjoy doing. Don’t censor yourself. If you like doing it, write it down. You’re not going to show this to anyone. On the third list, make a list of the things you hate doing. Finally, make a list of the people you know who have specific expertise or connections who might be able to help you with various aspects of your Fresh Start Success. Now look at what you’ve created. In those lists is the sprout of your reinvention and the tools to help you get there. Poonam Gupta-Krishnan went to school to be a chemist. She earned degrees in chemistry and education, and later taught math, physics, and chemistry. She moved into research and was very successful, working for two multinational chemical manufacturing corporations. She liked her work and the corporations gave her experience in both chemistry and manufacturing. Poonam also understood the technology challenges facing manufacturers. As a research scientist, she handled all aspects from lab research to the production process, which meant that she also knew where the processes faced problems or had room for improvement. She did well in the corporate environment and liked her work, but realized after a while that there were no growth opportunities for women of color. When Poonam moved into Information Technology, she gained a different understanding of problems from the user’s perspective. So Poonam developed software for manufacturing focused on fixing the end-users’ problems. Poonam became an entrepreneur. She started a company that provided software services to small and medium-sized manufacturers. Over the years, it grew into providing a range of data and information management products and services. Today her company has evolved to become one of the most sophisticated technology services companies in Big Data Analytics. Her firm provides IT consulting and Data Analytics services to the private and public sectors in manufacturing, education, healthcare, and finance. Poonam built her company facing limited resources, as well as social, financial, and health challenges. She is a first-generation immigrant who came to the U.S. as a student. When she resigned from her last corporate job, she had a two-week pay cushion and started her IT services company with no money. “I didn’t worry about money, even when I didn’t have much, because I knew that if you have quality offerings, the money will come,” Poonam says. It took two years to build her company and Poonam put everything into the business with no financial support or equity. “Having no money and making no money even after long hours of work was not fun,” she recalls. But she kept at it, honing her skills, getting out to network, and learning to be ‘a little bit shameless’ about promotion and asking for what she needed. She went back to her last employer and talked to the head of the MIS department, since she had parted ways on good terms. “I found that the fear is less when you focus on the job,” Poonam says of venturing beyond her comfort zone. “Frustrations are often deep and long, but if you do something enough times and you appreciate what you bring to the table, you will succeed.” Poonam found that her self-confidence and her belief in the value of what she had to offer grew as she got out and talked to people. “Stay with it, have faith, keep expenses low, and be humble,” she advises. For Poonam, the social part of growing a business was more difficult than the technical aspects. She was very aware that she was different, as a woman and an immigrant and a person of color, that sometimes presented a hurdle. “People subconsciously like people who are like themselves,” she says. “That can be difficult when you’re an intelligent woman trying to get into a male-dominated industry, and I was often the only woman present in Chemistry and IT circles. Men were used to a boy’s club. I looked different and was a woman, and I had family responsibilities, where men were free to just hang out in the bar and talk,” she recalls. Poonam networked with professional women in a variety of organizations and found them to be kind and supportive. She learned to accept their help, mentorship, and guidance. That led to an important discovery. “If you have something of value, the differences don’t matter,” Poonam realized. To get the word out, she gave free speeches on technology, innovation, and best practices, which also helped people get to know her and helped her become more comfortable with networking. As she demonstrated her experience and showed what she knew, people asked to learn more. In Poonam’s journey, she found opportunities to improve IT innovation in the government sector. “There’s a disconnect,” she explains, “because they lack a collaborative platform that brings private sector, public sector, entrepreneurs, small businesses, universities, and special interest groups together.” Poonam founded a not-for-profit organization, Government Technology Foundation, Inc. (GTF) to address that need. “The reason entrepreneurs take the route of ‘path least travelled’ is so they can fulfill their heart’s desire,” Poonam says. Along the way, Poonam faced health challenges with no extended family nearby. A serious infection caused problems that meant she couldn’t drive for over a year, and she was faced with large medical bills. During that time she had to delegate, and her employees at that point were not as skilled as she was. They made some bad financial decisions, which undid more than three years of what had been built. When Poonam returned to work, she knew she needed to turn things around, so she decided to lower prices and pick up small jobs to build cash. That got the business back on its feet and she kept improving processes. As her children got older, she could put more time into the company, and she is still constantly gaining new skills. “Persistence is the key!” Poonam says. Despite a later health problem and surgery, which led to more setbacks, Poonam’s persistence kept her and Big Data Services on track. She credits meditation for helping her overcome obstacles and improve her physical and emotional health. Poonam’s reinvention in starting Big Data was successful, and the company is still growing. But despite her success, Poonam believes that she and other female entrepreneurs still struggle more than their male counterparts. Regardless, she is determined to succeed. “Success is a journey for me, and I have been on that journey now for fifteen years,” Poonam says of the ups and downs along the way. From the time children are small, we give them the pretend tools of various jobs to play professions. Toy power tools, doctor sets, and chef’s pans abound, along with costumes for pretending to be police officers, fire fighters, pilots, soldiers, and many other jobs. We nudge children toward jobs we think they might be good at doing that pay well, and discourage them from career paths that might not be lucrative. But we say very little to our children about the pervasive climate in certain professions that makes talented people who don’t quite fit the mold feel uncomfortable and unwelcome. As you make your own Fresh Start Success, look beyond your title and salary to decide what’s missing in your current job from a personal satisfaction and balance standpoint. Does your employer appreciate your contributions and effort? Are your ideas heard with respect? Do you feel like you make a difference, not just to the bottom line, but in a meaningful way in the wider world? Does success at work mean compromising your health or family life, or having no time left to recharge? As you build your reinvention, take care not to perpetuate the same elements that made you unhappy in your prior work. Seize the chance to do this your way at every level, including creating meaning, satisfaction, and balance. Dr. Susan Sklar, MD wanted to be a doctor since she was fifteen years old. She knew she wanted a career where she could be of service, and considered being a teacher. Her mother, a survivor of the Great Depression, told her doctors never went hungry. Convinced that she had found a calling that was both secure and enabled her to be of service, Susan earned her medical degree and practiced Obstetrics and Gynecology for over 30 years. Her relationship with patients was deeply satisfying. Susan liked helping people feel better, enabling them to become healthier, and making an emotional connections. It was satisfying for her to reassure people and reduce their worry. But while the medical side of her work was satisfying, the business side was stressful. Forms, billing, insurance, and regulations meant more time focusing on paperwork and less time for patients. The overhead necessary to handle all the paperwork meant she had to see more patients to break even, reducing the time spent per patient and squeezing the relationship-building Susan valued. The frustration built up over ten years, but eventually, Susan felt like a rat on a wheel. Susan was afraid she would have to leave medicine in order to get away from the aspects of her practice that were driving her crazy. That was a frightening prospect, because after investing so much time in her education and building her practice, she wasn’t really equipped to do something outside of medicine. She wanted to be engaged with people in a helping field, and still have financial success. Then her son introduced Susan to another doctor who specialized in anti-aging medicine. This field of restoring poor health and promoting healthy longevity through prevention fit Susan’s professional interests as well as her own stage of life. Susan was intrigued. This was an emerging medical specialty that was relatively new on the market. Most people didn’t know what it was. Susan liked the emphasis on helping patients in ways they didn’t dream they could be helped. Because anti-aging medicine tends to be direct-pay, that reduced Susan’s frustration with paperwork and insurance. Susan was sixty years old, with a lot invested in her long-time career. She weighed her options carefully. She needed to finance her education in anti-aging medication and set up her new practice. One way would be to borrow from her retirement accounts and get bank loans. Borrowing from her retirement accounts and taking on debt was scary. The other option was to work part-time for the Veterans Administration. That would keep her from needing to tap into her savings, but it would slow down her progress. Susan felt a strong desire to begin learning and growing. That need for fulfillment won out over the risks, and Susan let go of the part-time opportunity to embrace her new calling wholeheartedly. Going into anti-aging medicine meant Susan had to do new medical training. It took her a year to learn the medicine. 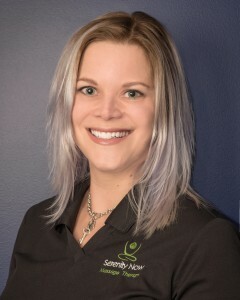 But what was really new was the need to market her specialty and educate prospective clients that the types of services and the benefits they produced even existed. Everyone knew what an OB/GYN doctor did and what type of medicine and services obstetrics/gynecology included. But anti-aging medicine was so new, the people who needed it most didn’t know that help was even available. Susan didn’t know anything about marketing, branding, or social media because her former specialty had not required her to focus on promotion. “It took me one year to learn the medicine and five to seven years to learn marketing,” Susan says. “It was faster to learn the medicine than the marketing!” Her new practice started out slowly, but Susan was motivated by the results she saw. She was helping people feel better and turning lives around. Gradually, word of mouth spread. Susan found experts to help her with marketing, and also found a mentor who directed her training and helped her develop a workable salary. Susan was fortunate to be able to tap into savings and apply for loans to finance her switch. Her husband’s income was an additional safety net. “The first three or four years were really hard,” she says. All told, it took eight years to get what Susan considered to be very good cash flow, but she began to take a salary comparable to her old income at five years. Now she is practicing a type of medicine that she loves, helping patients and continuing to learn and grow as a person while meeting her financial goals. Susan loved the core aspects of what she did—helping people, seeing results, making people better. The industry infrastructure, such as insurance paperwork and regulatory demands took her away from the core aspects she found fulfilling and produced enough stress that she thought about walking away altogether. What is noteworthy is that she found a way to make a strategic pivot that enabled her to keep the core aspects she loved—medicine and helping people—and do it in a setting that had far fewer of the pieces she found frustrating. Did you notice that Susan was sixty years old when she decided to go back for additional medical training, strike out in a new medical field, and start a whole new practice? It’s never too late to follow your heart and find your Fresh Start Success! My upcoming book, Fresh Start Success: Reinvent Your Work, Reimagine Your Life and Re-Ignite Your Passion, interviews 41 amazing people who have made big, successful career changes in midlife, and shares insights into their success and marketing tips that made their success possible. Making a Fresh Start Success doesn’t always mean completely leaving the old behind to make room for the new. Sometimes it’s a lateral shift, staying within a profession but changing the focus. When we come to a career/life crossroads, the idea that we have to jump instead of pivot can make us afraid to move forward. While some people embrace the idea for a complete reboot and the chance to do something completely different, pivoting allows you to keep one foot in the familiar while gaining a completely new perspective. If the fear of making a huge change is holding you back from Fresh Start Success, stop feeling like you need to make a big jump and look for an opportunity to make a strategic pivot! Comments Off on Jump or Pivot? When you look at your career, can you see a central theme that has transcended your individual jobs? In the previous blog post, Lauren was a teacher, and then a gymnastics coach, and then part of the management team at a performing arts school, and finally a life coach—roles that all centered around educating and mentoring. As different periods in her life unfolded, her central theme was reimagined, but it always remained a part of what gave her purpose and satisfaction. As you’re planning your own Fresh Start Success, realize that the answer to the question of what to do next might be closer than you think. Look for the central themes in your work history, and then look for other jobs that emphasize those same aspects. Don’t get hung up on titles—pay attention to what the meat of the actual job entails. You might find that a new career that seems radically different from your past on the surface shares essential common threads at its heart. Athletes don’t make it to the national level without good coaches. Coaches advise, develop training plans, assess the competition, refine performance, and encourage athletes to get past performance plateaus, personal challenges, and life’s rough spots. We wouldn’t expect a top athlete to succeed without a coach, so why do entrepreneurs believe we can do it alone? Coaching can take all kinds of forms for entrepreneurs. Life coaches help us figure out what we want to do for our Fresh Start Success. Success coaches help us get over limiting beliefs and behaviors. Media coaches help us look good in front of the cameras. Financial and systems coaches help us put together accounting and back office practices that work. Human resource and management coaches teach entrepreneurs—who are usually subject-matter experts—how to be a good boss and manage a company. As marketing consultants/coaches, we help entrepreneurs see and seize opportunities to gain visibility and translate that into a stream of new clients. The bottom line is, regardless of our individual competencies, there is always more to learn—we all need coaching of one kind or another. When you’re making your Fresh Start Success, don’t try to go it alone. If Olympic athletes need coaches, despite the fact that they’re the best in the world at what they do, then maybe you could benefit from experienced counsel, too. Don’t let your ego get in the way of finding the help you need to reach peak performance.